As I sat in the little cockpit with the canopy open, in front of a maze of dials, warning lights, switches and levers, the normally clear New Mexico skies began to let go. Drops of water spattered around the cockpit as Larry, the flight instructor, went over each system. My hopes of flying began to disintegrate. It never, never, never rains here. Why today? For the moment, at least, I had to be content with sitting in the cockpit. I had ordered the checkout video months before so everything looked familiar. I'm not sure why but I studied every detail for this one short flight. The instructor had redundant controls and more than likely he would be doing most of the critical procedures. 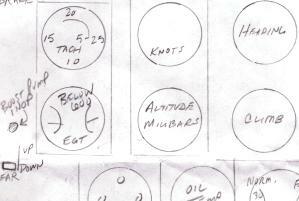 I had even carefully diagrammed the cockpit on paper, laying out everything exactly where it was in the actual airplane, tracing a dime with my pencil for each of the gauges. I studied this piece of paper on the flight down, and at a restaurant the night before. I knew how to extend the speed brakes and landing gear using the manual pump lever. I knew to turn off the aileron boost in the event of a hydraulic failure and where the knob was that disconnected the spring tension on the ailerons. Everything was familiar (heres' the list): gear lever and indicator, pressurization switch, flap switch, fuel igniter buttons, fuel levers, twin throttles, speed brake switch, elevator trim switch and gauge, fuel boost pump inop light, emergency brake handle, landing gear warning light, aileron boost warning light, aileron boost switch, generator off-line light, battery master switch, low-fuel warning light, fuel gauge, battery gauge, starter-on light, starter selector (left, right or neutral), fuel tip tank dump switches, hydraulic backup pump handle, emergency gear select switch, manual speed brake select switch, cabin depressurization switch and all of the temperature, pressure and flying gauges. Then Larry explained that the backup hydraulic manual pump controls were only in the front seat - my seat. With everything else this intimidating airplane had to throw at me this was just too much. Earlier I had confessed to Larry that my last one hundred and fifty hours of flying time were in a Bakeng Duce. And the one hundred and thirty hours before that were in a Cessna 152. I was holding my forty hours of ultralight time in reserve as my trump card. "Oh, you flew a forty-seven horsepower whiffle ball? 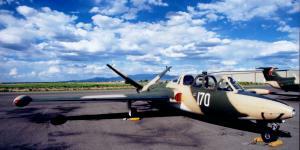 Well then, the Fouga should be a piece of cake." But, my lack of experience didn't seem to phase him. About an hour after the cockpit checkout, by some miracle or good luck, the weather broke and I was back in the cockpit - for real this time. I had expected Larry to do a lot of the critical stuff the first time but this wasn't to be the case. He talked me through the startup procedure, which I was already very familiar with - battery master on, emergency brake on, clear left engine, spool left, push igniter button and move fuel lever forward, watch the gauges, when exhaust gas temp reaches 350 release igniter, when tach reaches 5000 release starter. The left engine screamed to life. It was loud. Check warning lights and gauges. Generator warning light is out. Hydraulic gauge reads normal. Same starting procedure for the right engine. Canopy down and locked. Pressurization switch on. Brake off and throttles up for taxi. The Fouga doesn't have a steer-able nose wheel so everything is done by differential braking. Little taps on the toe brakes is all it takes. Then it'll wander a bit and a little tap will bring it back on track. But never, never lock up the brakes at high speed. Larry explained that this could blow the tires. As we taxied out I was adding up the impending damage expenses and figuring out how I was going to pay for them. We started the takeoff roll immediately upon entering the runway. Tap, tap, tap and we were straight. Throttles up. The Fouga drove a lot like my rental car. After hitting about forty or fifty knots there was no more tapping allowed. I fed in a bit of rudder to keep it straight. At around sixty I brought the nose up and we sped along like this until the wheels left the pavement. In the air, finally, and all of the fear and loathing of the past twelve hours dissolved. That knot in my stomach created by the negative weather forecasts from the night before - the fact that I was leaving early the following morning - unless I changed my plans - but that involved an avalanche of other problems - the intimidation of this complicated airplane - all of this dissolved. With the canopy closed and pressurized and the headset on, the scream of the engines became a muffled whine. It was that jet sound. When the pressurization came up the cockpit filled with the aroma of old aluminum, hydraulic oil, and all that stuff that makes that certain smell. It was that jet smell. And it flew like you would imagine a jet would fly - quick and nimble. Gear up and we were climbing at 120 knots. The New Mexico landscape, a completely unfamiliar scene to me, swept by. It looked like the simplified landscape from one of those military flight simulators - flat and drab with mountains on the horizon. We flew around a bit as I got the hang of the controls then returned to the airport. and there was the runway. I hadn't seen the runway out the front of my cockpit on short final for two years! It was unnatural. I put in just a little bit of flare. Then, with a solid thunk we were down and speeding along the runway. Advance throttles half way. Wait for the spool up then full throttle. Rotate and wait. In the air. Gear up. I just did a touch and go in the Fouga. Wow. We did two more touch and go landings then flew out over the desert for some fun. Shallow turns, steep turns, single engine flight, high speed flight, rolls. Because of the overcast we couldn't do loops. But rolling this airplane was a thrill. What a great airplane. Now if you're wondering what this costs, let's just say that an hour in the Fouga is worth thirty in a 150 trainer but is available at half the price. Actually less with the first time student, two-hundred dollar discount. This, of course, doesn't include the flight out to New Mexico, rental car, hotel, etc. After flying the Fouga I drove out to Bandelier National Monument, a beautiful 32,000 acre park, which includes an easily accessible and amazing collection of Pueblo ruins and cliff dwellings. The park also has campsites near the archeological sites and extensive hiking trails. After several hours there I drove through forty miles of the Jemez Mountain Trail Scenic Byway. Here I came upon a spectacular vast plain, nestled in the mountains, which was filled with tiny specs, which I was told (by some other excited tourists) were Elk. Hundreds of tiny specs. And another small group of really tiny specs, which I was told (they had binoculars) were wolves. So next time (after hitting the lottery) I'll make it a vacation. Maybe camp, visit the museum at Los Alamos, maybe drive down to Roswell and see some UFO's. The Fouga isn't the only airplane they've got either. There are four more jets to pick from - the Mig 15, L29, L39 and T33. As fuel burn goes up so does the price, but it's worth every penny. So what's a whistling turtle? I'm not quite sure why, but the Belgian Air Force gave this nickname to the Fouga. Maybe for the tight fit of the cockpit - like a turtle shell - and the tremendous whine of the engines. It's also been called the Dinky Toy and the Snipe. If you're interested in flying one of his jets, contact Larry at the Jetwarbird Training Center in Santa Fe, New Mexico. He's a terrific instructor and a good guy. Their website is http://www.jetwarbird.com.